Like any sport there's some basic equipment you should purchase in addition to the firearm itself. Here's a quick rundown. Please let me know if any of the links become invalid. They should be used for reference only and are not an endorsement that these are the best ones to purchase. Safety equipment: Eye and ear protection are a must. Safety glasses are fairly cheap. If you wear over the head ear protection then you want glasses that have thin or flat temples so they don't press into your head. Ear protection can range from disposable foam plugs to electronic ear muffs. Electronics amplify normal sounds like speech but automatically cut off loud noises to protect your hearing. They're great for hearing other people talk at the range and can be had for as little as $50. It's important to try them on to see how comfortable they are for you. 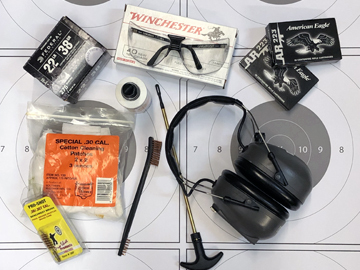 Cleaning equipment: In addition to wearing eye protection (to protect against splatter) you also want to wear nitrile gloves to keep the gun cleaning solvent off your skin. Remember the solvent dissolves lead, and that lead can penetrate your skin and be stored in your bones. Safety first. You will need a cleaning rod, caliber-specific brass brush, cleaning solvent, patch holder, cotton patches, brass brush and gun oil. There are basic cleaning kits that can get you started. Miscellaneous: Loading pistol magazines can be tedious. I like the Uplula universal magazine loader. It's a little tricky to use at first but makes loading magazines quick and saves your thumb in the process. What's not to like? I also like the G.P.S. range bags. They're well thought out and the rolling bags make it easier to transport lots of heavy gear. Finally you want a means to securely store your firearms at home. There are many good quality large safes if you have multiple firearms. If you want to keep a loaded firearm at home I suggest something like a Gun Vault to keep it securely locked yet quickly accessible. Knowledge is power. While the internet has opened the floodgates to knowledge, words alone are not enough. If they were then professors would be looking for new work. Let Gun Kraft help you expand your firearm knowledge and skills through personalized training and hands-on practice. Copyright 2014 Gun Kraft, LLC. All Rights Reserved.